Our next HLAA book club gathering is on Dec. 13th from 9am-10:30. It will be at the Sanderson Center in Classroom C with the hearing loop and CART. 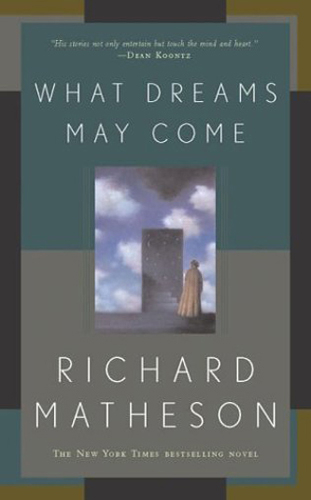 The next book being discussed is “What Dreams May Come” by Richard Matheson. It’s on Kindle for $8.89, there’s used on Amazon starting at $1.50 and it can be ordered through the library too. Click HERE for the Amazon link. Even if you haven’t read the book come on in as the discussion are a lot of fun. Come help us pick out the next book for February. (The book club alternates with the HLAA bi-monthly meetings.) Here’s the questions that will lead the discussion…. Describe a situation where you have felt a feeling of a presence. Who do you believe it was? Why do you believe they were there? If you have never felt such a thing, describe one someone you know has experienced. How does this affect your belief in an afterlife? How is Ann’s refusal to believe in Chris’s afterlife existence affecting her and her family? Explain how she is affecting the belief of her children. How does Summerland compare with the typical concept of heaven? Explain. Discuss why souls that have evolved, such as Albert and Leona, are still in Summerland. Is Ann’s suicide a predictable plot point? Why or why not? Is suicide as wrong for someone not in his or her right mind? Explain. Discuss free will and Ann’s suicide. Use your arguments from Albert’s position and from Chris’s position. Why does Ann want Richard to stop trying to console her? (a)She wants to have time to find Chris alone. (b) It only makes her feel worse. (c) She thinks he is coming on to her. (d) She does not believe Chris is alive in spirit. Who do Leona and Chris met? (a)A man who will find out what Chris wants to know. What place does Chris visit? (b) The Hall of Literature. (c) The Hall of Religious Theory. (d) The Hall of Good and Bad Deeds. Who writes a letter about Chris? What do the damned do in the vacuum of Hell? (a) Live pretty much the way they’ve always lived. (b) Talk to themselves about the same things over and over. (d) Plot revenge against God. How do the works of literature exist in this library? When is Ann to join Chris in Summerland? Why is it hard for Ann to believe that Chris is still alive in some form? How does Chris’ heart beat?